This crostini recipe is terrific for entertaining. Combine my homemade ricotta, some honey, lemon and thyme on a toasted baguette and you will go to heaven it’s so good. We love serving this to friends when they come over. Its refreshing and decadent tasting all at the same time. The ricotta is so creamy it does really well with the honey and lemon zest to cut through it. I also love to add thyme, but you could do rosemary or even mint if you wanted to. A little note on the bread. I don’t eat white flour often at all but when I do I make sure to either buy high-quality fresh baked bread or I make it myself at home. If you are absolutely grain free, this ricotta would taste delicious on pears, apples or strawberries as well. 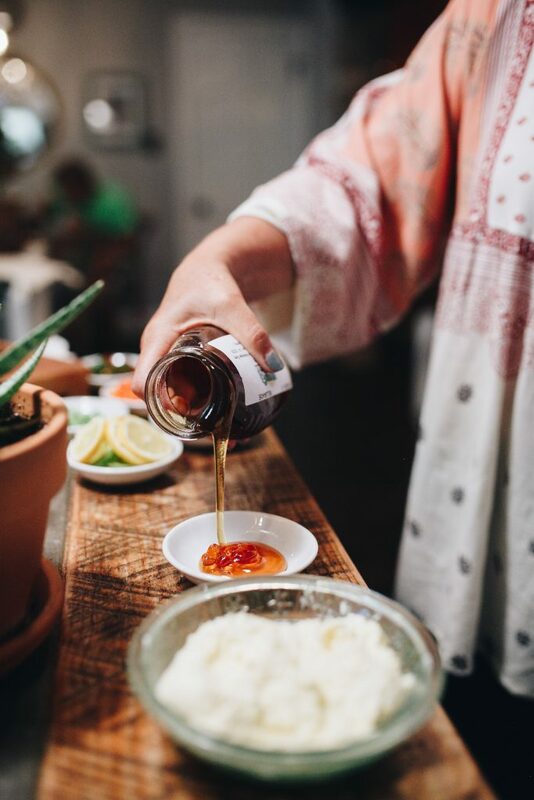 Enjoy this recipe, there are so many ways to build a delicious little appetizer when you have fresh, wholesome ingredients. Have fun mixing it up! 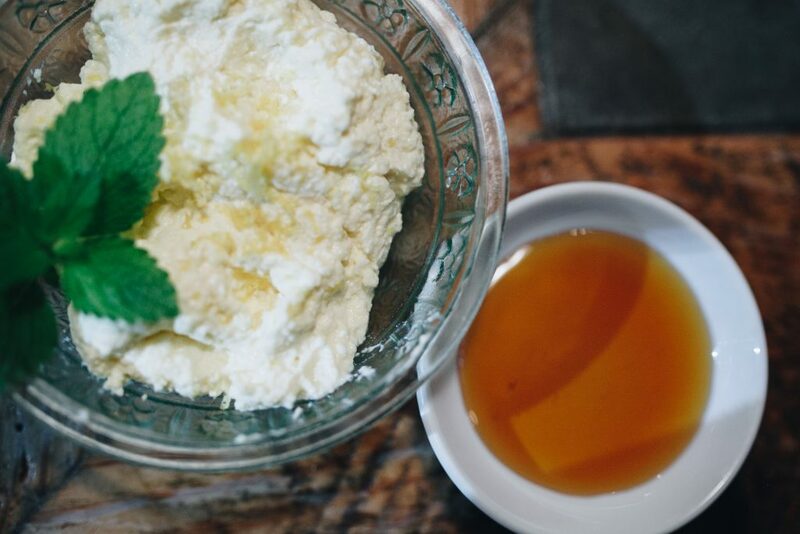 I can almost guarantee that this ricotta will make an appearance in other recipes later on. Here is a quick little guide for assembling these crostini that are bound to impress. 1. Slice the baguette and place on an oven proof tray and drizzle with the olive oil. Bake at 350 until the bread is toasted nice and brown. 2. While the bread is cooking, zest your lemon in a small bowl and finely chop the herbs. Set aside for assembly. You can also zest the lemon directly into the ricotta, it’s delicious that way as well. 3. Once the bread is hot out of the oven, rub with the peeled garlic cloves. 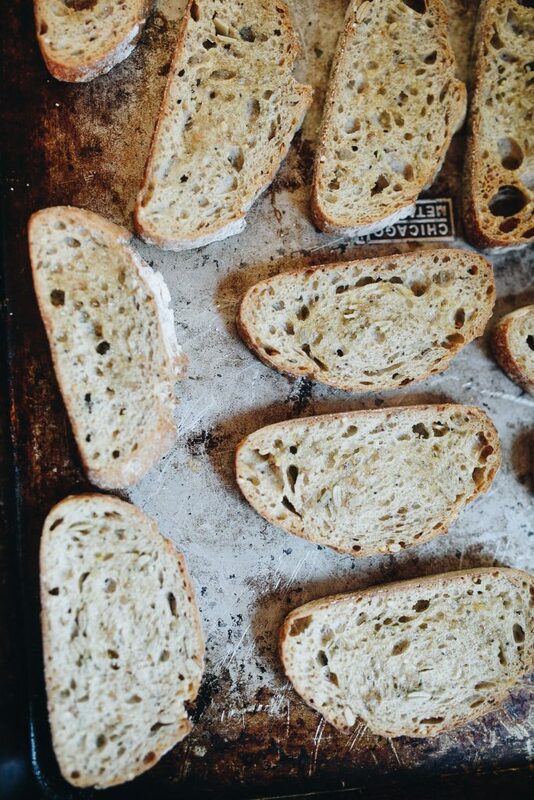 It immediately infuses the bread with fresh garlic taste, in my opinion, its far superior flavor to garlic salt, but you can use that in a pinch. 4. 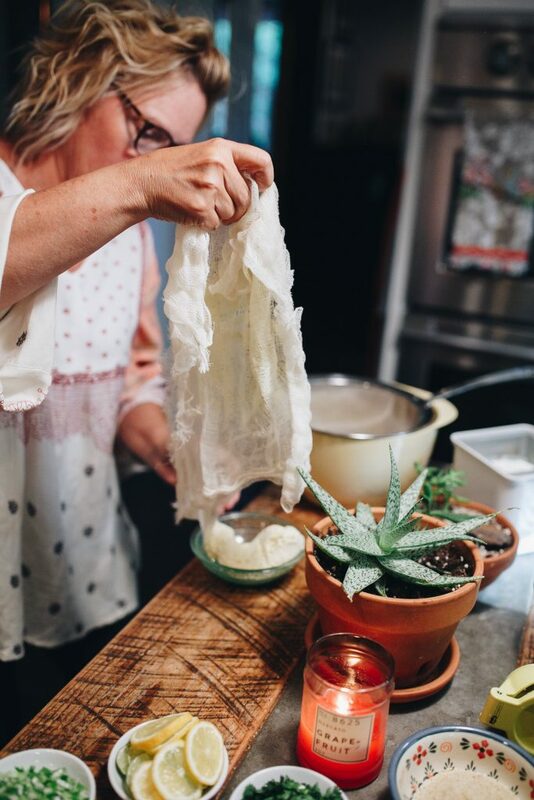 Let the bread cool a bit and when you are ready to serve, pull your homemade ricotta out of the fridge and either serve in a bowl or dollop as much ricotta as you want on each crostini, drizzle with the wild honey, lemon zest and herbs. Enjoy! Note: You can either assemble these ahead of time or put out all the “parts” out and let each of your guests assemble how they like it. You really can’t go wrong! Slice the baguette and place on an oven proof tray and drizzle with the olive oil. Bake at 350 until the bread is toasted nice and brown. 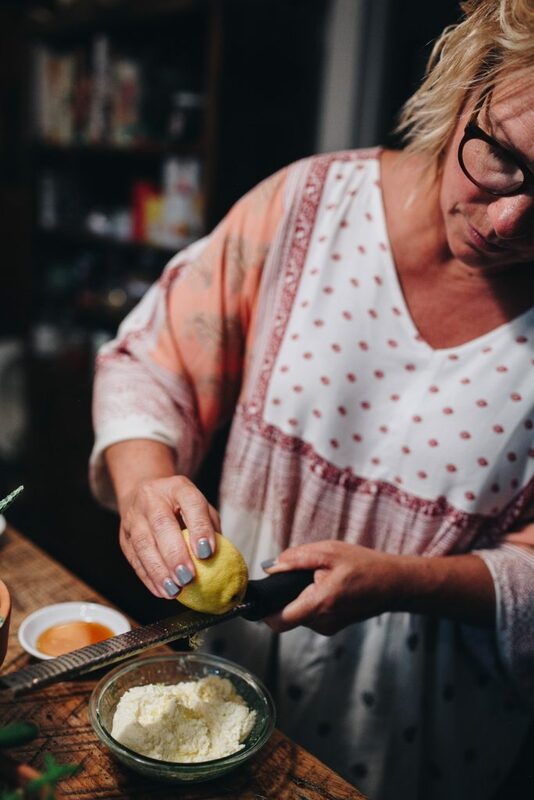 While the bread is cooking, zest your lemon in a small bowl and finely chop the herbs. Set aside for assembly. You can also zest the lemon directly into the ricotta, it’s delicious that way as well. Once the bread is hot out of the oven, rub with the peeled garlic cloves. It immediately infuses the bread with fresh garlic taste, in my opinion, its far superior flavor to garlic salt, but you can use that in a pinch. 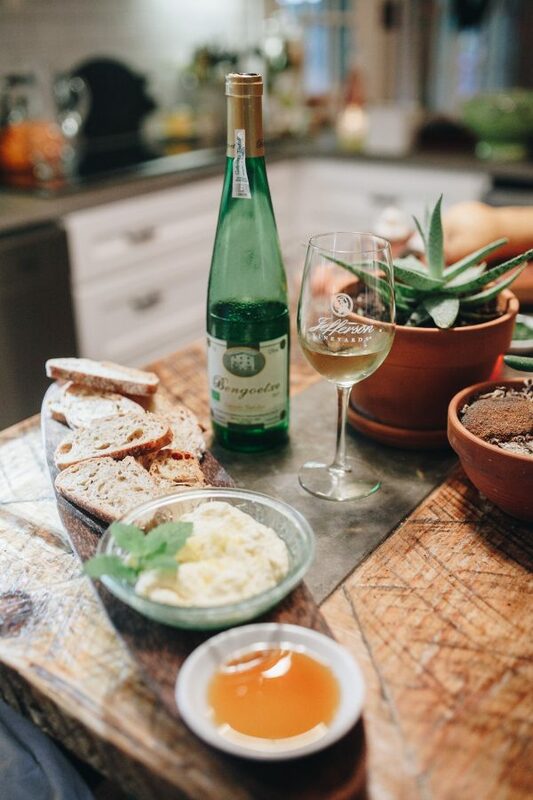 Let the bread cool a bit and when you are ready to serve, pull your homemade ricotta out of the fridge and either serve in a bowl or dollop as much ricotta as you want on each crostini, drizzle with the wild honey, lemon zest and herbs. Enjoy!